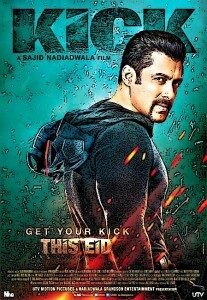 Salman Khan is still ruling Bollywood as his Superhit film ‘KICK’ runs successfully worldwide. According to a popular web portal KICK has easily moved ahead of SRK’s biggest grosser ‘Chennai Express’ at the domestic level. ‘KICK’ has reached 226.98 Crore Nett yesterday whereas Chennai Express was only 226.70 Crore Nett lifetime. Film will be around 227.50 cr nett after 3rd week. Prior to the release of ‘KICK’, Chennai Express stood at the second position among the highest grossing films in the industry with regards to domestic collections. Now, ‘KICK’ has earned the second spot after ‘Dhoom: 3’ in domestic collections making it Salman’s highest grossing film ever. ‘KICK’ has made 366 Cr gross worth of business worldwide in the third weekend since its release and is still going strong. Salman, the devil has been successful in captivating the audience with his dare devilry, witty dialogues and death defying stunts. His train sequence has caught the viewers at the edge of their seats. The film has broken a number of records which makes it the most outstanding film of this year. Sajid Nadiadwala has now become the first debutant director with a 300 Cr film to his credit.